There seem to be two obvious decor styles when it comes to velvet: a sleek velvet sofa in either Millennial Pink or emerald green propped on brass legs, or plushy, stuffy textiles that would feel at home in Buckingham Palace. The former is overdone, the latter is hardly fresh and exciting. And yet, the material continues to be a prevalent one, especially during the winter months when we’re all craving something a bit softer and richer. Velvet is an easy way to bring elegance into any corner of the home—and from large investment pieces to small accents, we have a few ideas on how you can decorate with it in a cool, modern way. Here are 10 velvet decor items that feel anything but expected. Hand-stitched velvet piping lends a cool, textured effect to this cornflower blue cushion cover. Create an eclectic mix of pattern and textures on your sofa by tossing this in with other throw pillows—the more materials and prints, the better. The combination of linen and velvet is an unexpected one, but the two materials pair well in this ivory pillow sham. Pick up a pair to turn your bed into a cloud-like oasis that’ll make you want to go to bed at a reasonable hour. Low on square footage? If a big dining table is out of the question, informal gatherings and dinner parties may be more your speed; for this, you’ll need slightly unorthodox seating. Velvet floor cushions are more comfortable than having your guests perch directly on the floor, and the luxe material makes even the casual feel a bit more sophisticated. Calling all maximalists: We found the pillow for you. Inspired by Moroccan riads, the eclectic mishmash of color certainly feels otherworldly. Pair with an antique chair or equally bold seating option for a true maximalist statement. Curtain panels may not be the most exciting thing to shop for, but when done right, they can be so much more than a necessary privacy tool. Blush pink velvet is heavy enough to block out early morning light without totally darkening the room. Pair with a cool tieback (like this circular cast iron option from Anthropologie) as a finishing touch. Retro in the best way, this armchair is peak 1970s, and we’re here for it. 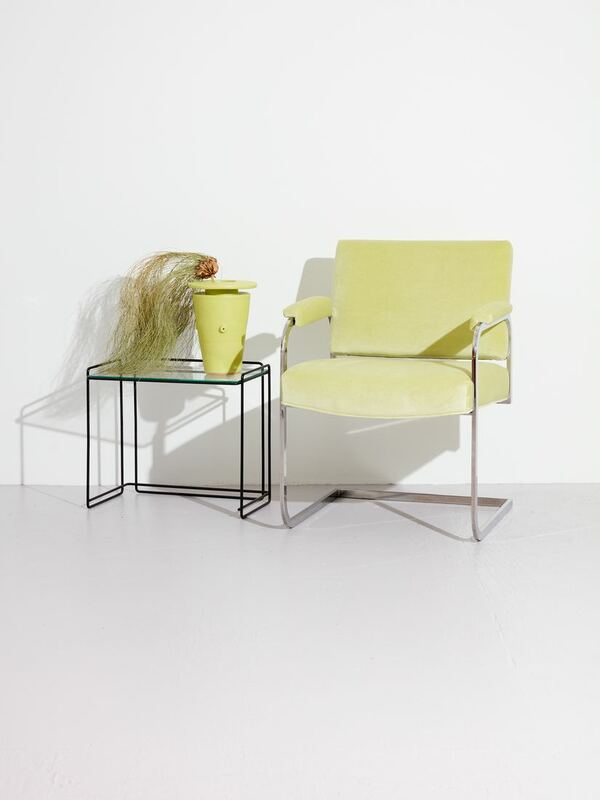 From the avocado green hue to the chrome hardware to the velvet upholstery, it’s a statement and a half. Bring it into your office to totally revolutionize boring workspace decor. A velvet sofa brings instant elegance, and when said velvet sofa is coated in a deep plum color, even more so. The antique style of this piece lends itself well to a richer material, so play up the drama by placing it in a living room with moody and saturated walls. Maybe you’re looking to bring the luxe material home in a less dramatic way. In which case, allow us to introduce you to Ferm Living’s ottoman collection. Available in a range of sizes and jewel tones, they’re a more digestible way to bring the velvet trend to your living room or bedroom. It might have brass legs, but by choosing a unique color—like a pretty raspberry, for example—you avoid veering into cliches. Keep it at the foot of your bed with a patterned blanket draped over it to squeeze an extra pop of color into the room. The soft green is so natural that it’s almost a neutral, so if you’re a minimalist looking to branch out a bit in 2019, this chair is a good first step. Clean lines balance out the decadent velvet fabric. It’ll look especially great in a neutral-toned living room, where a plethora of different materials adds textural interest against the velvet. The color ensures it’s an instant focal point.